On a road trip around Oklahoma, it was the Will Rogers‘ museum that proved the most insightful. The museum featured exhibits from his Cherokee Cowboy character and his radio show from the 1920s. I had heard snippets from those populist radio talks throughout my life from my father and uncles. I think their talk of the notions—that corporations cut jobs when they can and don’t gratuitously make jobs as a boy scout gesture and that advertising doesn’t want you to look beyond your nose—were both spurred by his radio addresses. And I grew up listening to descriptions of scenes played by Will Rogers and Tom Mix. In this museum, those scenes were being played on a big screen! All the while on the road, I was singing. I alternated between the Rodgers and Hammerstein show tune, “Oklahoma”, and Merle Haggard’s song, “Okie from Muskogee.” Although my AAA tour book didn’t list much to see in Muskogee, I had to go there. At Bacone College in Muskogee, the small but excellent Ataloa Lodge Museum about the Native American history in the area made the trip worthwhile. The museum curator recommended I visit the nearby Fort Gibson. Established in 1824 and abandoned in 1857, this is a fort from the “F-Troop” time period, now maintained as a National Parks Service site. It was amazing how all those wooden structures had survived unscathed by fire. (I didn’t even have to close my eyes to imagine a canon being kicked so that it blasted a corner of the fortress into smoke.) Military forts such as Fort Gibson were posted about Oklahoma to try to keep peace. It was to the Oklahoma Territory that President Andrew Jackson had sent all the Native American groups east of the Mississippi River. 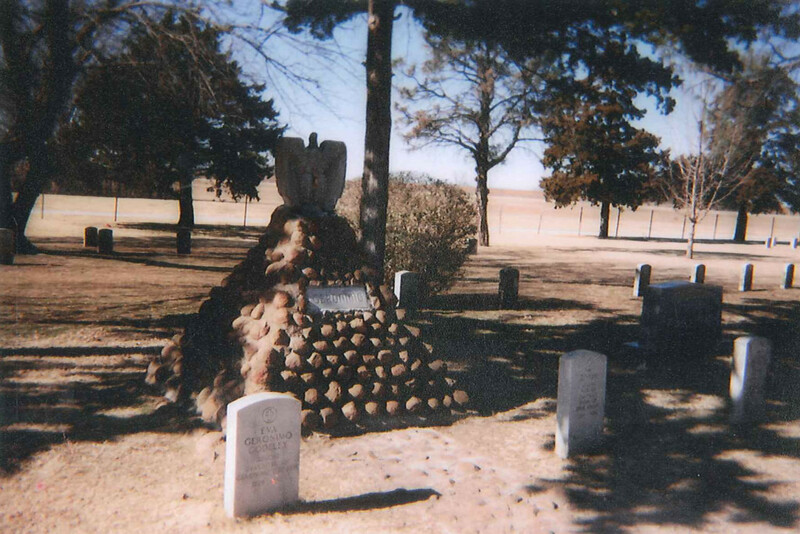 Lots of people died en route to the Oklahoma Territory, which was Pawnee territory. And the Pawnee weren’t too keen about all these other groups moving in. So there was a lot of conflict and strife. 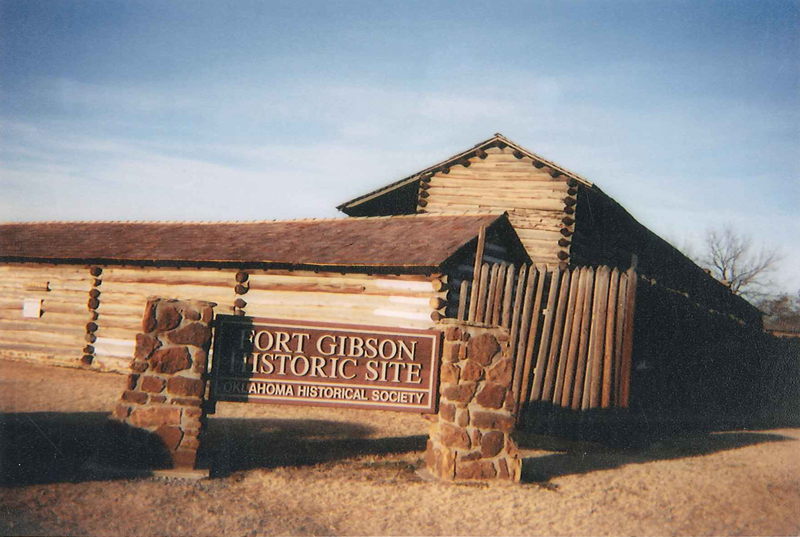 Military forts like Fort Gibson were established to keep the peace among the varied Native American groups. The AAA tour book described a walking trail in memoriam to the Trail of Tears, so called because of all those who died on that forced march into Pawnee territory. I was lost for hours looking for it. Was it my frustration with the roads or the vibes of the site getting me distracted? I did find Geronimo’s grave site; it was still with some difficulty but of a different sort. Almost there, I found I had inadvertently locked my keys in the car. I was in a modern military installation where I had stopped to check out a small museum. Only miles away from my destination, the keys had fallen from my pocket onto the driver’s seat, and I peered in the car window with frustrated longing. I called AAA but later learned their truck had been turned away at the military gate so I had to call AAA again and this time find who else I needed to call to get permission for the AAA truck to enter. Ultimately, this made my destination more meaningful because I had much time to study the museum exhibits about the relocation of people to the Pawnee territory and its fall out. It was good to see Geronimo‘s grave monument befitted a military hero. I think Will Rogers would have agreed with me on that.